Many restaurants in Branson offer not just delicious food but also drinks and live entertainment. Beautifully located in the area where live shows abound and near Table Rock Lake, Crazy Craig’s Cheeky Monkey Bar is the perfect place to have a good time and enjoy awesome drink specials. This unique night spot in Branson aims to provide guests a safe place to enjoy sumptuous food with entertainment options. This restaurant in Branson offers guests drink specials every day, entertainment, live DJs, themed parties, live bands and more. Located just a few miles from the strip and features picturesque view of Table Rock Lake, you’re sure to love the beautiful ambiance of the place, the relaxing atmosphere and easy going attitude that you want as you enjoy drinks and a great night out with friends. Come by and discover why Crazy Craig’s Cheeky Money Bar is Branson’s most popular new place for drinks, fun, dancing, games, delicious food and more. When you check the restaurant’s bar entertainment calendar, you will see who is playing on such date. So when you visit the place you’ll have a great time knowing who’s going to perform. Crazy Craig’s Cheeky Monkey Bar is the only bar in Branson where smoking is allowed. So this place always gives ultimate fun to all guests. This restaurant features a DJ and live bands to give guests some much needed nightlife. Offering drink specials every day, you’ll also enjoy happy hour from Monday through Friday from 12 pm (noon) up to 6 pm. You can also have the chance to play pool for free during happy hour too. The bar also offers non-stop food service as well to keep you enjoying a great time through the day and night. Don’t miss to check out the restaurant’s tropical tiki themed bar with the smilest, most friendly and happiest staff. Crazy Craig's Cheeky Monkey Bar is Branson’s best bar for BBQ, drink specials, and live music. So make sure you try their best BBQ in Branson with an appetizer of Quesadillas. This restaurant in Branson is a perfect dining spot for creative spirits, tasty eats, and entertainment. 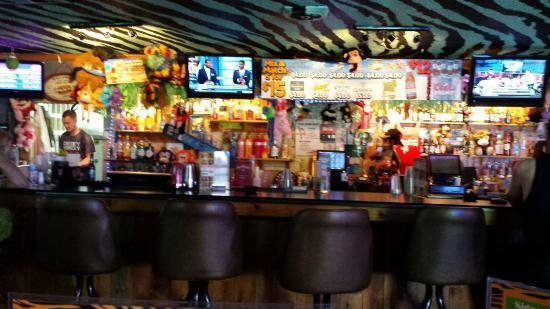 Their tasty quesadilla or burger paired with a Monkey Mai Tai is something you can’t resist. If this is not your thing, then maybe you’re up for a Drunken Monkey, or maybe a Grape Ape. These are not the only refreshing adult beverages, there’s A Monkey’s Uncle, the Upside Down Monkey Cake, and Monkey see Monkey dew, and many more. This restaurant also offers tons of games including darts, pool and electronic games to help give you a great time. You can also sit back, relax and listen to whomever is the performer that night. In this restaurant, you can celebrate your birthday party or something to enjoy with just your friends. If you are looking for a unique night spot in Branson to enjoy not just delicious food but also drinks and entertainment, then check out Crazy Craig’s Cheeky Monkey Bar.